Almond Cookie by Carol’s Daughter was first introduced to me years ago when I was still in high school. My mom bought the lotion and body wash for herself and I remember stealing it from her every chance that I got until it ran out. I loved the scent... it actually smelt delicious like warm cookies! So, when I was recently trying to decide on my latest fall scent, my mind immediately thought of Almond Cookie! I rushed to the Carol’s Daughter website and it was just my lucky day, because they were having a sale! You all know how I feel about sales. 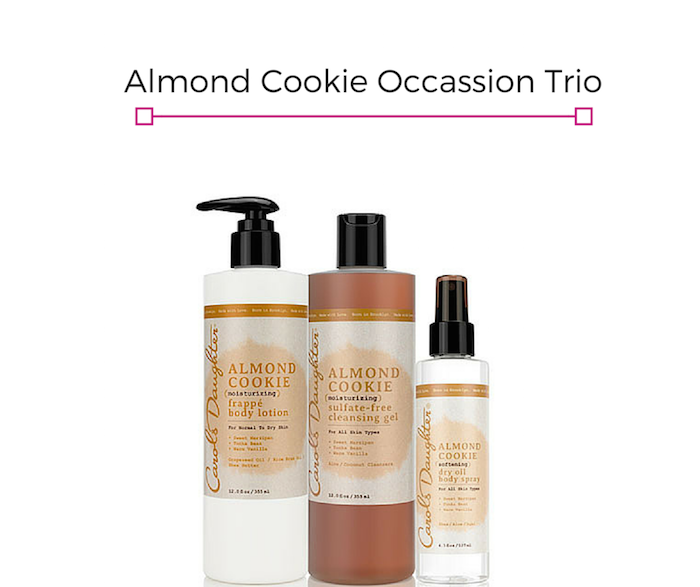 The Almond Cookie Occasion Trio was going for $30.50, which is a $34 value! The trio includes a 12.0 oz body cleansing gel, a 12.0 oz frappe body lotion and a 4.0 oz dry oil mist. What's currently your fall scent of choice? Let me know in the comments so that I can check it out!